There are few people on earth better equipped with the natural innate ability to make us feel guilty than our mothers. In our culture guilt has been instinctively crafted to an art form designed to influence our behaviors. It is a learned behavior passed on from generation to generation. Feelings of guilt can be self-inflicted or can be imposed upon us by other people. When guilt is legitimate, it spurs us to do better. When it is unwarranted, it only causes anxiety and hinders our ability to make sound decisions and provide quality care. As a parent's care needs increase while they undergo the natural aging process, the amount of time and energy required of the caregiver increases exponentially. It is very normal to have feelings of resentment as demands on our time begin to radically change our daily routines. Often adult children already have their hands full caring for the needs of their own children. The average woman in America today will spend more time caring for her parents than for her children. She is typically 45 to 65-year-old married female with children at home, in college, or with families of their own and thus can feel herself sandwiched between two generations. As her parents' needs for assistance increase over time, she often feels as though she simply cannot do enough for them. Often she will become frustrated when her efforts to try to "fix" things that go wrong in her parents life begin to create conflicts in her own life, and the fixes never seem to last. Ultimately she begins to feel that she is losing control of her life and realizes that things that were once routine for her and easily manageable are quickly becoming more than she can handle. Conflicting priorities can often lead to feelings of helplessness and guilt that she is not doing anything well. This self-imposed guilt then becomes her constant companion. Others can also impose guilt upon us. Failures in our elder caring duties, and obligations to our own families can lead to criticism from those whose opinions we value most. One is never really prepared to accept responsibilities thrust upon them by their aging parents. Few people understand the complexities of health problems, insurance coverage, assisted living and nursing homes, drug plans, Medicare, legal obligations and other senior-related issues. 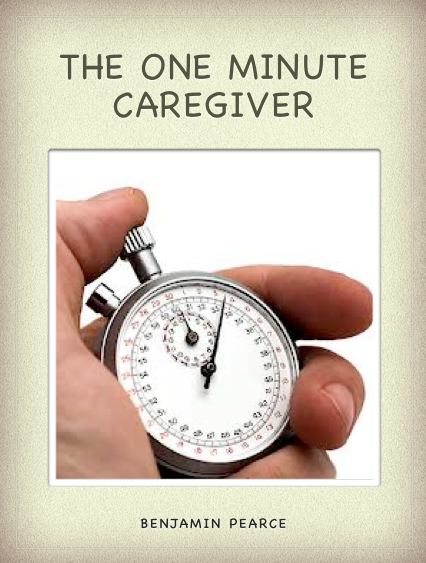 Caregivers continuously bombarded by these issues are bound to make mistakes, which will frustrate them even further. Uninformed family members, and siblings seeking to offer help, often only serve to highlight the primary caregiver's shortcomings. Just remember, there is nothing out there that you can't learn, seek out the advice of professionals such as Geriatric Care Managers, Eldercare Attorneys, local support groups, and the local library. Feelings of responsibility set us up for the probability of occasional feelings of guilt. We must be able to distinguish between legitimate guilt that motivates us to do better and harmful guilt that might be undeserved and leave us dispirited. Sometimes it might be helpful to write down the things that make you feel guilty. Examine the underlying reasons and determine if a solution is within your power. Sometimes compartmentalizing a large problem into several smaller, issues can make things more manageable. Constantly fretting over what seems to be an insurmountable responsibility can only lead to more anguish and more guilt. Tackling and completing a few problems can give you a sense of accomplishment and build your confidence to handle those never-ending new surprises as they arise. Consider that your parent may be feeling guilty because of they are imposing on you, while you are feeling guilty that you don't have the time to do more.1 Also, it is never helpful anguish about the past, concentrate on what can be done now and resist the temptation to allow old conflicts to create guilt today. To determine if the guilt you are feeling is warranted, ask yourself if you have done everything that is practical and necessary within your own limitations. What is important is ensuring the quality of life and meeting the realistic needs of the elderly. It is not your role to insure everyone's happiness, only your own. Perhaps much of the guilt comes from thinking that you have more influence than you really do. Often as the caregiver is pulled in conflicting directions, she may invite her aging parent to come live with them. Caring for a loved one at home may not be the best solution for either. Many people have made promises to each other about their elder care when they are young thinking the day will never come, but it always does. Often the caregiver struggles to meet the ever-increasing needs of their loved one at great personal sacrifice. Be realistic about what level of care that you can safely provide. Financial resources should be applied before the caregiver themselves begin to weaken. Often the decision to move out of the home is delayed until a nursing home is the only option. Consider using the financial resources while she can still gain some benefit from them in a more social environment. Once the funds are exhausted, the Medicaid alternative is always available in the nursing home setting. Many senior living environments can provide the additional cushion of care for your parent when they really need it. This way professionals can deal with the issues that may be unfamiliar to you and when you visit your parent, your time with them can be spent more relaxed. This will help to relieve the stress that may be building in your relationship, and help to quiet the guilt.